AMPANG, 12th February 2018 – Purina, one of the leading brand in the pet food industry has announced Bujibu Chempel as the new brand ambassador for their gourmet cat food range, Fancy Feast today. The announcement was made in conjunction with Bujibu’s third birthday which falls on February 13th. Held at the Society for the Prevention of Cruelty to Animals (SPCA) animal shelter, the exclusive celebration was themed, “A Fancy Feast Birthday Pawty with Bujibu and Friends”, as Purina and Bujibu shares this special moment with the animals-in-need at the shelter. “As one of the leading premium cat food brands in Malaysia, we strive to deliver best nutrition and care for our pets. Hence, we see Bujibu’s position parallel to the ideal Fancy Feast cat in terms of getting the best care and best meal available, thus why we have selected Bujibu to be a Fancy Feast ambassador,” said Lam Pui Yuee, Commercial Manager of Purina Malaysia. “We are honoured to celebrate today’s special party together with SPCA Selangor. It is a pleasure to be able to share and help in whatever ways we can,” she added. Bujibu, the British shorthair feline is owned by celebrity duo Hanis Zalikha and Hairul Azreen. His humorous captions and take on the daily life of a fancy cat has resulted in him being one of the most famous cats in Malaysia with a following of over 1.1 million Instagram users. He was bred by celebrity cat breeder, Johan Eskandar of Johan and His Cats and originated from Russia, which explains his last name, Chempel. “We can see that Bujibu really enjoys eating from the Fancy Feast range of gourmet cat food by Purina – the recipes are savoury and well-crafted with real and high-quality ingredients. We’re really happy for him to be chosen as a Fancy Feast ambassador,” said actress Hanis Zalikha, Bujibu’s ‘mommy’. Having Bujibu around has made the family happy as it tightens their bond and creates more quality time for the family. Bujibu also has a ‘brother’, son of Hanis and Hairul, Yusuf Iskandar, with whom he is starring with in their own reality show, “My Little Heroes – Yusuf & Bujibu” on Astro Ria. The two are particularly close with each other as the two-year-old boy grew up with Bujibu by his side. 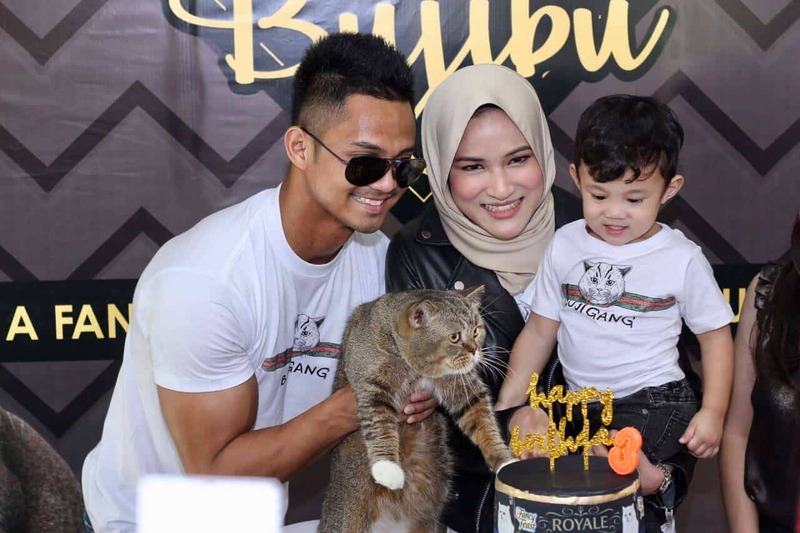 For the cat superstar, Bujibu’s family has chosen to have the birthday party at SPCA Selangor to give back to one of the main organisations in local animal welfare. “Bujibu is an important member of our family and we love him very much, so we’ve given him nothing but the best. However, we also would like to shed light on other cats who might not be as fortunate as Bujibu by sharing with the SPCA cats his favourite food,” Hanis Zalikha explained. The event started with Bujibu cruising through with his brother Yusuf in their cute little car. After making their rounds around the shelter, cutting Bujibu’s birthday cake and a photo session with the media, the family then proceeded to spend time to feed the other cats at the SPCA cattery. Purina had given away 600 packs of Fancy Feast gourmet cat food exclusively for the event. For more information about Purina and its latest products, kindly visit purina.com.my or contact the Purina customer service at 1 800 88 7462.